It should be your wedding your way!!! Hi my name is Larry Watson. I have been a licensed Minister for 30 years. I have performed both large and small weddings. I am hear to assist you in having "Your Wedding Your Way". It is important to me that your day be special and unique. I have pre-recorded music and a sound system available if you need it. 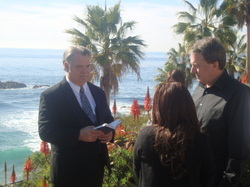 You can pick one of my traditional vows (Traditional Vows) or I can help you write your own. I am willing to assist you in any way that I can. Go to (Contact Info) to write or call me.